Organic Superberries Aroniaberry+ Shots. This product delivers all the benefits of berries in a shot. The natural goodness and power of the Aroniaberry and the delicious dark red Acerola berry, paired with green tea, make this 2 oz. powerhouse a daily go-to. Drink Superberries Aroniaberry + Shot by itself, or combine it with your favorite beverage for a great-tasting, refreshing energy enhancing shot. The organic aroniaberries in this shot contains a powerful blend of antioxidants. Numerous studies confirm that compounds present in aroniaberries are strong antioxidants and are effective in neutralizing free radicals. The acerola berry has a sweet and sour taste and is a great source of Vitamin C. The antioxidants found in the green tea contribute to overall wellness. 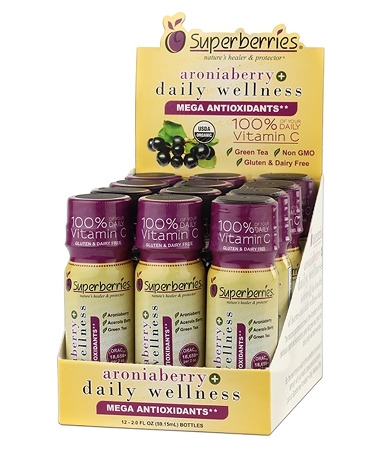 Each bottle contains 100% of your daily Vitamin C and has a high ORAC antioxidant value. It is gluten, dairy and fat free with only 60 calories. This product contains no GMO ingredients. Free shipping on orders over $45. Water, Juice Concentrate: (Aronia Berry Concentrate (Organic Certified), Apple Juice Concentrate (Organic Certified)), Agave Syrup (Organic Certified), Natural Flavoring, Potassium Citrate, Caffeine, Green Tea Extract (OrganicCertified), Acerola Berry Powder (Organic Certified). Caffeine Content: 60mg/2 FL. OZ. I love this product. I take it before I travel to help ward off any germs that might be floating around in an airplane. It has a great flavor and convenient to just throw in my purpse.